S.J. 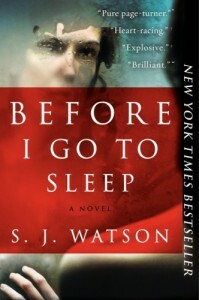 Watson made quite an impression with this debut novel. I don't know where the author got the idea from but it is such a peculiar yet possible way to live. How sad to have no accumulation of memories. What a unique, well-written psychological thriller. Watch the book trailer on www.literarymarie.com to see a hint of the suspense in Before I Go To Sleep.